It's time to go old school. With a nod to yesteryear, these button-fly jeans are a denimhead's dream. 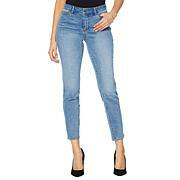 Add in the raw hem, which you can wear cuffed or uncuffed, and you have cute, colorful jean with character. Great quality, fun color and perfect fit. True to size, I did not go down a size because I didnt want them skin tight, fits great just as my normal sizing. 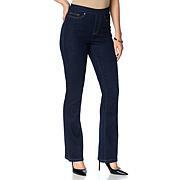 I purchased these jeans in the botanical floral in my usual size and they fit great. Love the floral print which looks like spring/summer. The raw hem is a nice look. Would buy more of these jeans. Bought these cuties in botanical print in size 16 & normally that size gives me wiggle room in skinnys but these were tight. Had to wiggle the bum in and then some but they do look hottttt! So lightweight and sassy for So FL weather. Too cute! !